We are offering Mechanical Online Coder to our clients. We are offering a wide range of Automatic Batch Coding Machines to our valued clients. 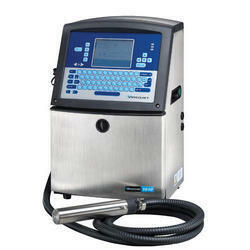 These Automatic Batch Coding Machines are highly demanded and are available at market leading price. Backed by the team of experienced work force, we offer to our esteemed customers a wide range of high quality Electropneumatic Intermittent Motion Coder. These are manufactured under highly strict measures in order to maintain its compliance with the well-defined quality standards. Moreover, clients can grab these Electropneumatic Intermittent Motion Coders from us at most competitive price. Suitable for mounting on any INTERMITTENT MOTION Vertical /Horizontal Type F.F.S Machines for Printing B.No. Mfg., etc. on Pouches. Capacity : Up to 80 Impressions/Mint.